Flower heaven. What gardener wouldn't find themselves bug-eyed at this lavish sight! Salivating is more like it. Or maybe you prefer pink. Acres and acres of 1 gallon plants just waiting for eager gardeners to claim them and give them a good home this spring. 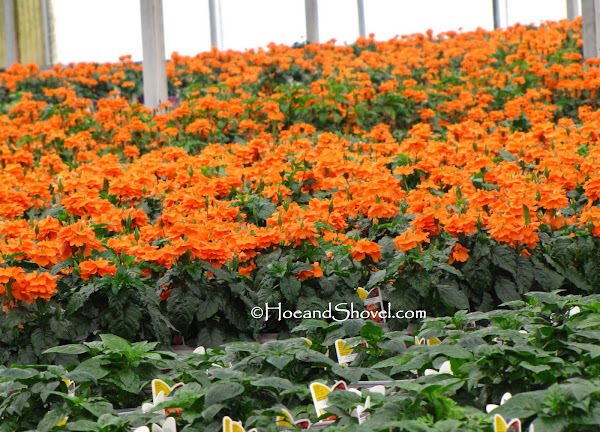 If you like orange and many gardeners must because an overwhelming number of purchasers make this Crossandra infundibuliformis 'Orange Marmalade' one of the top selling perennials for Florida gardens. 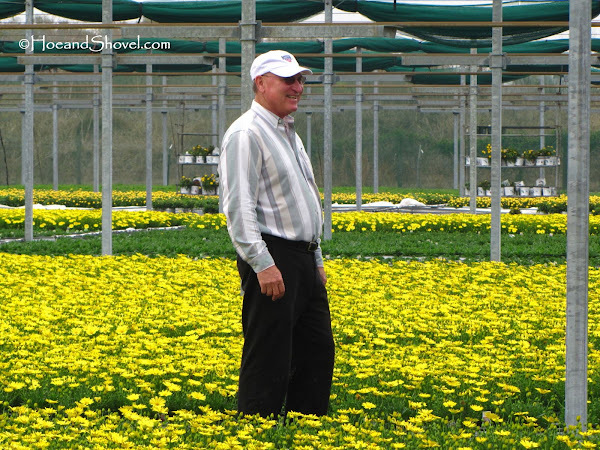 In 1982 Rick Brown and his brother Dave Brown founded Riverview Flower Farm. Rick is generous with his enthusiasm and information about plants and the industry in general. He is also a hearty encourager to every home gardener with any inclination toward creating their own gardens. His genuine passion is revealed by his desire to see common gardeners like me be successful in our endeavors. You can also find him promoting Florida gardeners and bloggers through his Facebook page at Florida Friendly Plants and his blog by the same name Florida Friendly Plants. Anyone can join in discussions on a number of topics on his Facebook page once you click the LIKE button. Rick hosted the Hillsborough County Master Gardeners for a tour of Riverview Flower Farm a couple of weeks ago. I'm one to be intrigued by the how's and why's of life. 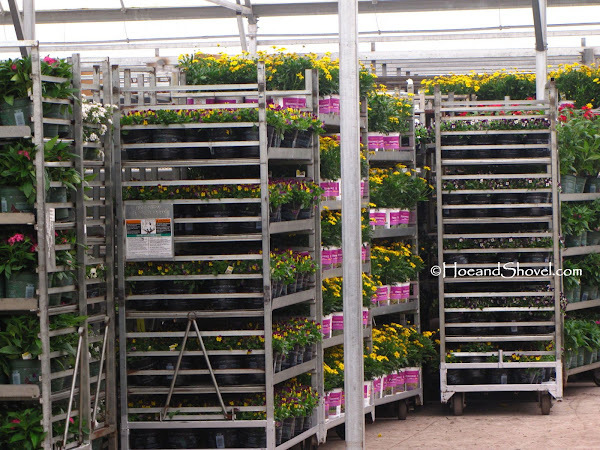 For me to see firsthand the process of how all those vigorous plants end up on the shelves for consumer purchase had my attention at the outset. Breathe deeply. 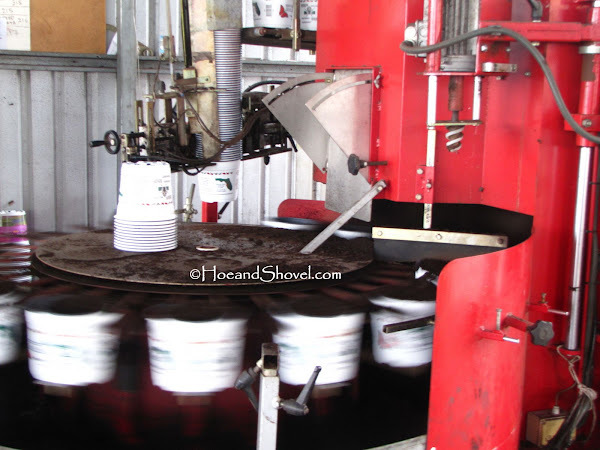 Can you smell the luscious, earthy scent of all that fresh dirt spinning its way into containers? Almost as pretty as the flowers themselves. 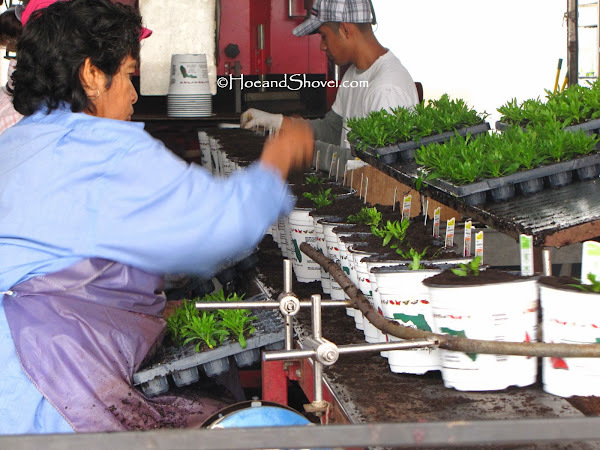 Riverview Flower Farm is always striving toward improved operational sustainability. The organic soil that fills these pots is alive with beneficial organisms that assist in growing a healthy root system before these plants reach your garden. You won't need as much salt-based fertilizers when you bring these plants home. Growing in rich organic matter means the microbes multiply and protect against disease and nematodes. 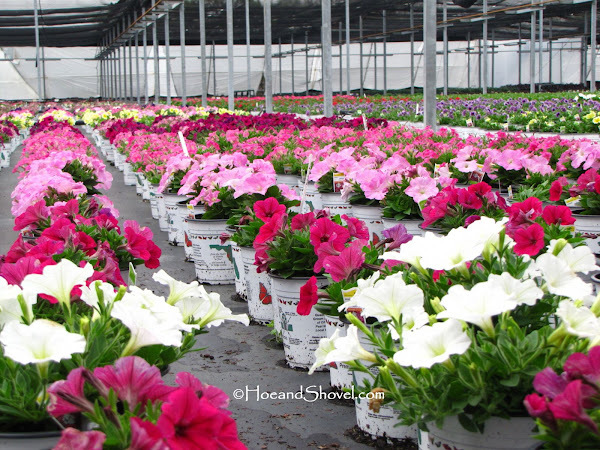 Plants not sold are returned and composted and mixed with other organics such as local yard and tree waste to supply 35% of the soil needs at Riverview Flower Farm. It's time to spread some roots. The starts of tiny seedlings getting a larger pot for further growing room. 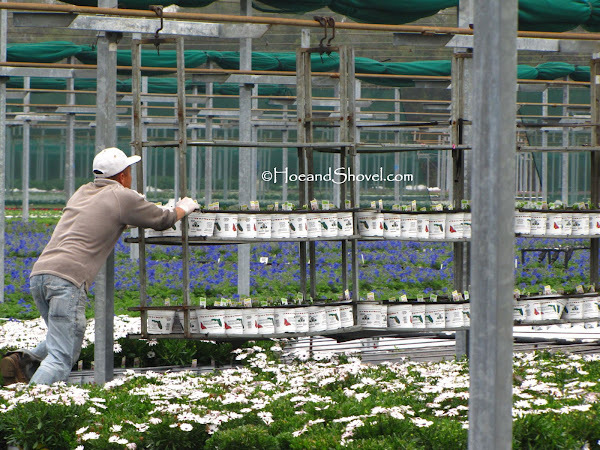 Just how do all those plants get watered and irrigated and fed and protected from the elements? Frost cloth is used for freeze protection down to 20F in many of the growing zones. Closing off the heavens with this retractable 'roof' is used in other zones. These methods eliminate using warm ground water for heat. An Integrated Pest Management program is practiced using spot fertilization, garlic oil extract, zone management, and the use of the lowest toxicity products available. 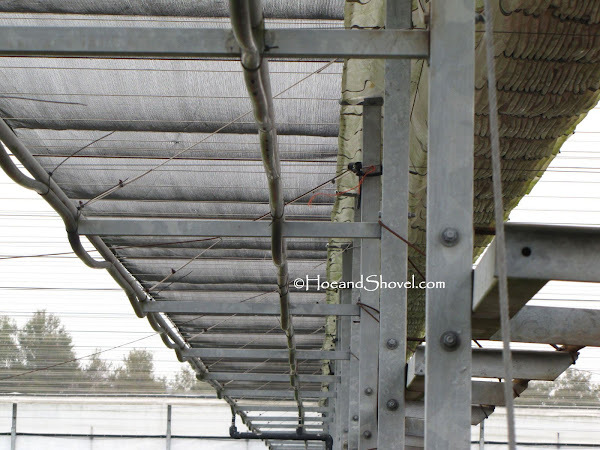 A drip irrigation system running for 10 minutes at a time with pots place under it (see pipe lines above) alternating left and right of the line to keep the drip line in position. Capillary mats are used in other zones. Water soaks the pot from the mats evenly coming up through the roots. 6-8 ounces of water is applied as needed in the drip system. These methods save 95% of the water lost to evaporation of overhead systems. Instead of using motorized tractors and trailers to move plants throughout the facilities a man-powered monorail system safely handles the transportation of plants from one growing area to another in an efficient manner. And in a matter of weeks the final product is here. 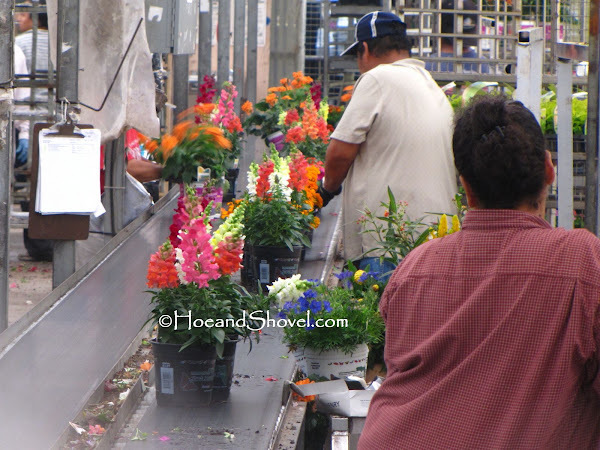 Healthy, lively, colorful plants on the conveyor belt being sorted and stacked onto shipping carts. 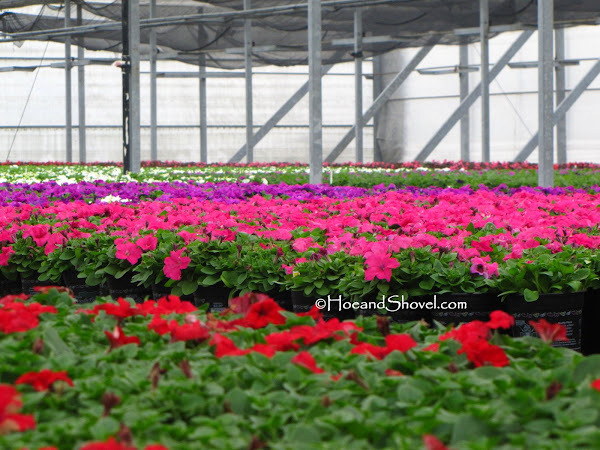 Riverview Flower Farm has 56 acres of production on 151 acres. They distribute to 144 Home Depot Stores from Tallahassee to Key West. Speaking of generosity. 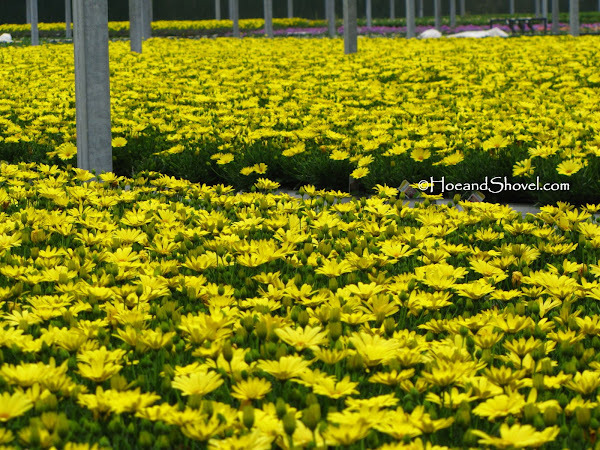 We were each blessed with 6 of those 'Voltage Yellow' Osteospermum you see in the opening photo to take home with us. 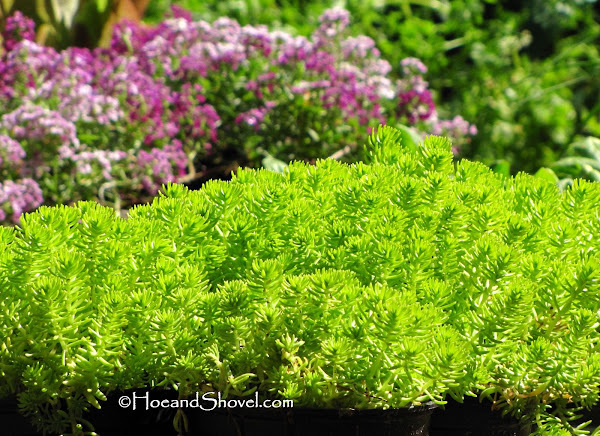 And a tray of much-loved Sedum hybrid 'Florida Friendly Gold' was a parting gift as well. If I can just get the rest of the sod dug out I've been working on I know right where my new plants are going to be sited. Thank you, Rick. And thank you Florida Friendly Farm for a wonderful morning full with plant talk and shared information. Thank you so much for coming and this nice story. I am so glad you were able to visit and spread the word about flowers and gardening with microbes and organic soil. It is a lot of work to make compost or costly to buy but good gardeners, like you, know that it really makes gardening rewarding. I am always glad to share that message. I look forward to you visiting again. Wow! What a fascinating place! I love seeing how stuff works. That monorail is sheer brilliance! And I can just about smell that wonderful scent of soil. I would love to take a tour myself. Thanks for sharing this experience, Meems. Incidentally, you, a "common" gardener? I think not! Meems ~ Thank you for the lovely tour of this wonderful organic growing facility. What a treat to have been able to do this, and your gifts are great too. 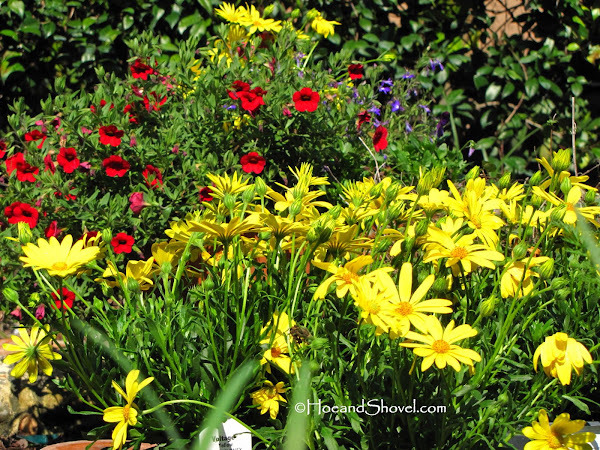 Enjoy making space for these and having them grow in your gardens. Thank you also for the link to the Fla Friendly Blog. I just took a quick peek and look forward to going there to spend some time reading and enjoying pictures. I have bookmarked it for future visiting anytime. What a nice day that was for you! Thanks for sharing it with us. Be sure to share pics when you get your gifts planted. What a wonderful experience for you, and then for us as you pass along your field trip. I love the Florida Friendly plants from Home Depot. I will follow the Florida Friendly facebook link now...and thank you for sharing! Meems, flower heaven is right! What an operation Rick has...very impressive! You're right regarding Rick and his generous nature...we've never met in person but he has been a wonderful support of my gardening efforts as well as so many others. Your post also makes the Home Depot flowers much more endearing to me...I've seen where they come from and those who care for them. Nice connection! What an extraordinary tour! So much color. It's a nice change from our landscape. All those bright-colored flowers just look like Florida! Sounds like a great operation. 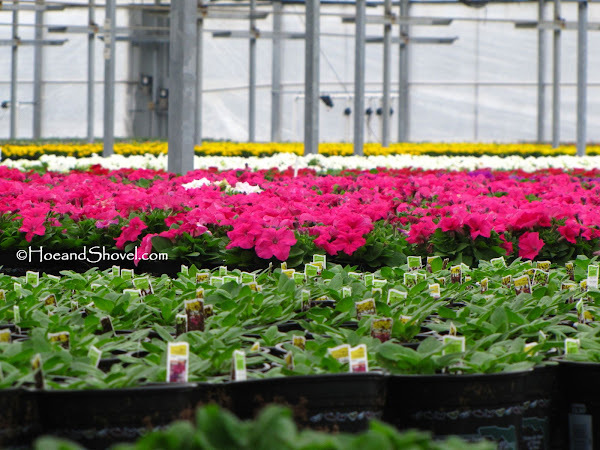 You must have had fun visiting Riverview Flower Farm! The spread of flowers is just beautiful. I enjoyed learning about the composting and watering practices used there. Makes me happy to buy their product and know that they are truly being "Florida Friendly." Meems: thanks for a wonderful tour! I often use Rick's "Florida Friendly Plants" site for reference when choosing the plants. How great that Now I got to know the story behind those healthy beautiful plants through your eyes. Thanks! I really need to put more effort to the composting since that alone just makes such big difference on the plant's well-being! I would think I was surely in Heaven. 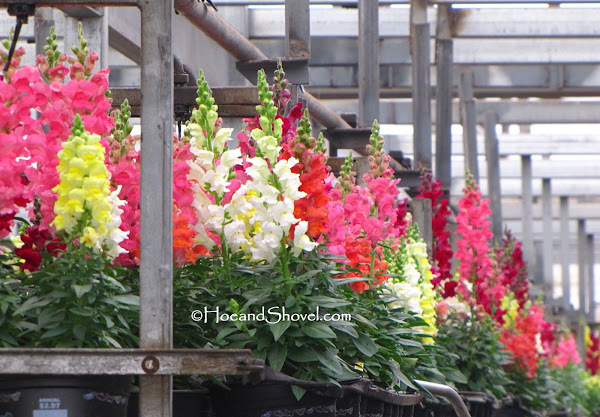 Just look at all of those gorgeous flowers.Rows and rows of rainbows in bloom. What a fun tour Meems. Meems oh Meems you were in Flower heaven. What a treat to read and see. Wow how I wished that i could have been there. Just lovely! Ooh, I love all that blue and yellow. A great and colorful tour, Meems. Must have been an exhilarating day. It's good we are all finding out how good soil is the best thing to invest in... then the flowers/plants are enjoyed so much longer. It was a very informative and much over-do visit. Thank you again. Oh, dear Daisy, but that's the beauty of it all... I am as common a gardener as anyone. The Tampa Tribune has hosted some group tours to the public at RFF also... if you want to make the drive. Watch for them on The Dirt blog @ TBO dot com. Rick's blog and website is full of data on Florida Friendly plants. You will find it is an invaluable resource. Yes, this weather is like spring. It is wonderful to be outside. I will definitely keep you up to date when I get those pretties planted. Still digging sod...it's been slow in between planting elsewhere and pruning all the dead stuff... a little at a time.It will get done though. Still looking for the name of my little blue flower for you. Don't give up on me. Oh, good... so happy to be of assistance. Yes, very generous in so many ways. A love for horticulture and the promotion of others is immediately noted on having any contact with Rick. And isn't it a good connection to know the background of any business where you spend you hard-earned dollars. It is like a thousand pretty garden centers in view all at once. Glad to brighten up your winter world. Color, color everywhere... it is SO Florida. Finally. I got there. Definitely true leaders in Florida Friendly practices. Composting can be done even in a small garden. You will appreciate the rewards and it will be SO worth the time and energy. Acres and acres, too. So beautiful. That combination caught my eye, too. So delightful together. Thanks for the visit. It is rejuvenating and inspiring to be around all that plant life and brilliant color. How interesting! I worked for a greenhouse back when I was a teenager, but things were not quite so high-tech, and it would be many long years before I was bitten by the gardening bug. How do the osteospermums behave for you in your garden? Mine seem to barely hang on to life. They disappear into the ground sometime in July or August and don't reappear again until spring. I usually think they are dead, then I'm surprised again. I'm sure one day, they'll disappear forever. Nice to see such a beautiful operation. The color looks fantastic in those greenhouses. Congratulations, Meems! I'm presenting you with the Stylish Blogger Award! Feel free to pass it on. See Maple Hill for details. Technology and education has really improved making it more possible for large operations to do their part to conserve. I buy new osteospermums every winter because I love them so much. For me, it is worth the dollars to have them until the middle of summer. Last year I put them in pots and they lasted longer than years before when in the ground. This is my first year for 'Voltage Yellow'. It is one that is supposed to do better in our heat and humidity. We'll find out come July/August. I've placed a couple in containers and the ones gifted to me will go in the ground. Always good for the soul to see so much *alive* with vibrant colors. It was a beautiful day. The name of the plant with the blue flowers is Blue Sage 'Eranthemum nervosum'. It is an older variety not found in garden centers. Susan (over at Simply Susan) gifted a seedling to me and I have made many root cuttings from it. It is cold sensitive unfortunately. But I love the blueish leaves and texture even all summer/fall.The winter blooms were full of buds when the first December frost took it down 2/3 of the way. Now there are several blooms on the bottom... I am happy to root a cutting for you and send it to you later in the spring when it comes back. Just let me know. You can e-mail me at hoe and shovel garden dot com. I'm also leaving this comment over on the original post where you asked the question... not sure where you might check back. 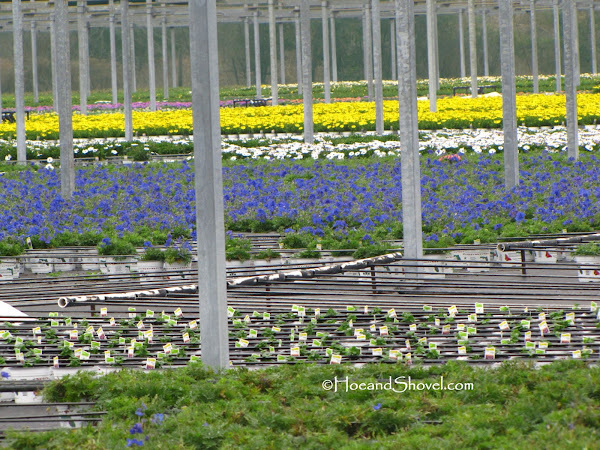 What a sight to behold...all those gorgeous flowers, and free plants...icing on the cake! What a great time you must have had. It looks like a gardener's dream of heaven. Don't they all look happy and healthy! I bet is smells delightful too in the greenhouses!